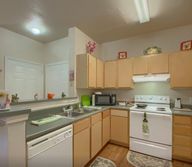 Description: Enjoy coming home to your pet-friendly one bedroom, one bath Seguin, TX apartment home which features a spacious walk-in closet and a private patio. Description: This two bedroom, one bath Seguin, TX apartment offers refined finishes like oak wood finished cabinets and a large pantry, all for an affordable price. Description: Stratton Oaks Apartments are proud to offer this spacious two bed, two bath home which features Earth-toned Formica countertops and pristine white appliances. Description: This three bedroom, two bath Seguin, TX apartment home offers ample space for the whole family and a separate dining area for family dinners.